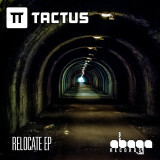 Scottish producer/DJ Tactus – head of ABAGA Records – is back with a 4 track EP out on August 4th, 2014 through his own label. The ‘Relocate EP’ is a collection of tracks made at different points over the last 3 years, and will finally be available for a ‘name your price’ download. Despite being recorded at different times, the songs work together, melding jungle sounds with short edits of reggae vocals and rhythmical basslines, which translate well to dance floors, while retaining melody and a relaxed atmosphere. Tactus’ last EP had a great reception, with plays from various DJs and radio shows, including Sub.fm and Radio 1’s Ally McCrae, who “loves it”. Between gigs, Radio 1 and Sub FM guest mixes and international radio plays, this EP is presented by a visionary producer looking to find new ways in which to meld styles, experiment with sounds and snare placement, whilst emphasising melody and sub frequencies. It will be the labels’ 40th release, and after being Vic Galloway’s (BBC Radio 1) ‘One To Watch’ of 2011, the label is still proving that it’s a force to be reckoned with. Tactus has a number of projects lined up, including several more EPs on ABAGA Records out later this year, and live appearances up and down the country. Big thanks to all the support!